There are bestsellers, and then there’s Michelle Obama. The #ForeverFirstLady has sold nearly 10 million copies of her memoir, Becoming, making it one of the most popular books of the decade. The parent company of publisher Penguin Random House, German media powerhouse Bertelsmann, announced Obama’s book sale numbers on Tuesday—along with a prediction from its CEO, Thomas Rabe. 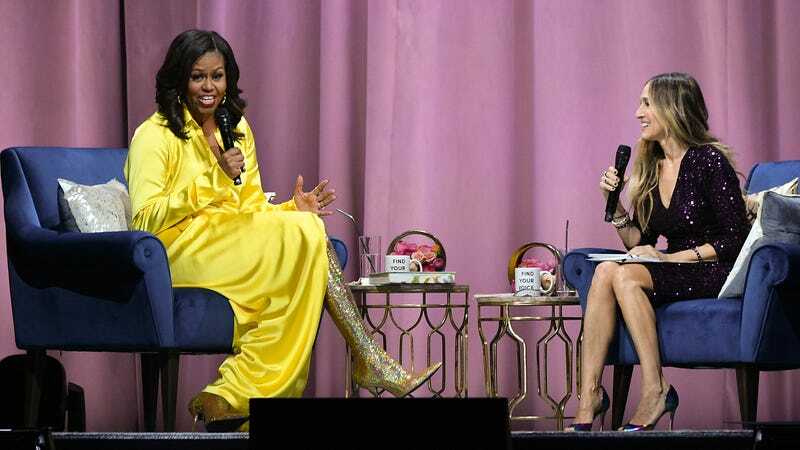 Now, it’s no secret that Michelle LaVaughn Obama is the queen of flexes great and small (I mean, you remember those sparkly, thigh-high Balenciaga boots! ), but let’s marinate for just a moment on how stunning this achievement actually is. Obama’s book helped catapult Bertelsmann to its highest sales in more than a decade; the company cashed in on approximately $20 billion in total sales last year. The candid memoir, which traces Obama’s upbringing in Chicago’s Southside up through her and Barack’s time in the White House, sat at the top of the bestseller list longer than any book since 2012’s Fifty Shades of Grey. As far as visualizing what 10 million books looks like—imagine everyone in New York City holding up Obama’s book. Got that? Now, imagine you took the entire population of Dallas, Texas and gave them Obama’s book. See all those people with books? That’s still short of 10 million. You know, another slight Michelle Obama flex. We’ll see if Michelle’s husband, ol’ whatshisface, can match her success. Barack’s White House memoir is slated to come out later this year.